This is part of the research on italian victims of 9/11 posted by Simon Shack here (and in previous threads as well). Because of its in-progress nature I am sharing it in the public area for the time being. Refer to the mentioned thread for the previous episodes. So, I had an exchange via email that produced something, I wouldn't call this a breakthrough (not yet), but I will gladly summarize it here, leaving out the emails in their entirety for brevity and also because I never warned my counterpart that I could post this material on a forum. Looking for info on the Italian victims of 9/11, I decided to contact AVITER, which is the Italian Association of Victims of Terrorism. The AVITER website has a page dedicated to the italian victims of international terrorism. Mostly journalists or tourists allegedly involved in terrorist events abroad. The page lists victim per dates, and as you can imagine there were no victims listed for 9/11! Actually, as I write this, the page recites the following: "sono in corso di accertamento i nomi delle vittime italiane al World Trade Centre di New York: 10 italiani e 270 italoamericani." 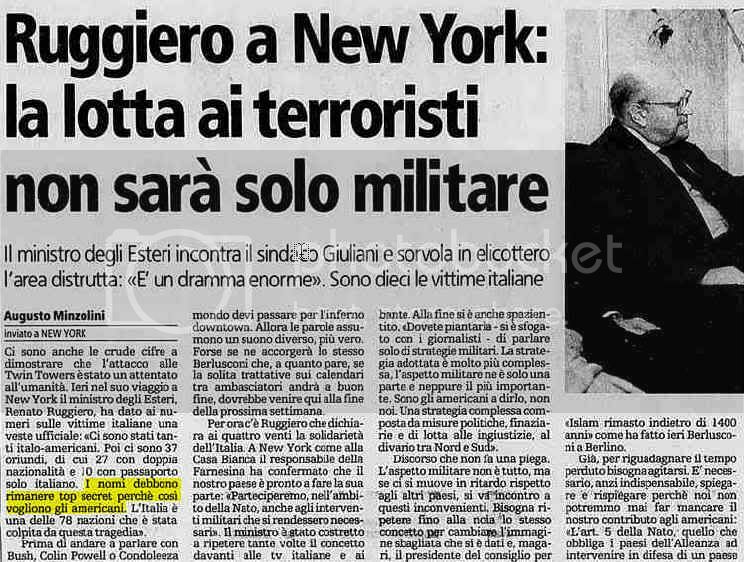 [Names of italian victims at the World Trade Center are being verified: 10 italians and 270 italo-americans]. This 9-years-late note is the result of the inquisitive emails of yours truly. After my first generic email to the Association where I only pointed out the possibility that there had in fact been italian victims on 9/11, I received a five lines prompt response that in short stated: "Francamente non abbiamo mai avuto notizia della presenza di vittime dell'11/9 con la cittadinanza italiana." [Frankly we never had notice of presence of victims of 9/11 with Italian passport]. It also promised further research into the matter: a candid attitude of my interlocutor at AVITER that so far hasn't changed and of which I can only be grateful. Incredible slip of Minister Ruggiero, that implies a rule-of-silence that doesn't seem justifiable even right after the events (and certainly is not justifiable now, almost 10 years past). Facing this, my AVITER interlocutor tried to speculate on the reasons for the cover-up, but nothing seemed to explain the fact that the Italian Government, and his Association as well, never acknowledged such victims, their names or exact number. Was everyone sleeping on 9/11? Even now, as AVITER refers on its website to 10 possible Italian victims to be verified they do it not because there are governmental sources for it (they still have to receive official answers on the matter, and I doubt they ever will), but only because they infer these numbers from such news articles (from which actually the Italian victims should be counted as 27, not 10, since a double passport still means Italian citizenship). Of course we know there were no Italian victims in the WTC as there likely were no victims at all. But it is simply not acceptable anymore for the Italian authorities to shy away from this falsification of the truth. If not brought to admit the cover-up, they have to be forced to lie, to officially claim a few vicsims for them and be called (by us) on it. This is the reason we citizens have to push for "official" statements and records. Ultimately, AVITER maintains to have contacted on this issue the Italian Embassy in the U.S. and even a "family member" of a victim of 9/11. We'll see what these contact will bring. My interlocutor at AVITER has since written an appreciable post on his blog summarizing his point of view on our exchange, quoting more contradictory sources and pointing the many strange discrepancies and inconsistencies of this story. He is far from doubting the existence itself of the victims, but hey, Rome wasn't built in a day. If he is reading this, I cannot but invite him to try and learn more about the supposed victims. 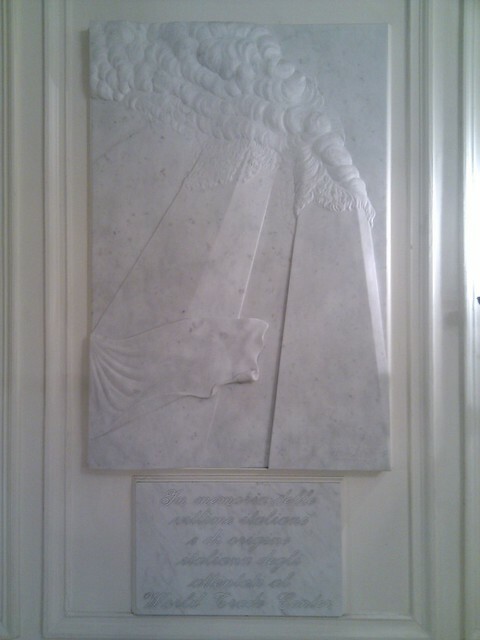 To find pictures of them, or read, for example, the memorials, such as this or this, two alleged italians: and try to find in them a single truthful word. Bottom line, following my inquiries AVITER changed its official position about the italian victims of 9/11. Now the ball of contradictions is in their court. Regardless, this made me feel a "citizen", simply put, which is a very empowering feeling -- I certainly recommend everyone who can do something similar in their own country to do it. here there are the names found by a researcher of the victims. Same old tired photo carrying, pathos laden crap! Last edited by brianv on Sat Jan 29, 2011 9:43 pm, edited 1 time in total. Keep digging, Non & Simon. The "grieving mother" kinda reminds me of the woman in the yellow? rain covering from the "commemorative gatherings" - cant lay my hands on the photograph right now!! SmokingGunII wrote: Keep digging, Non & Simon. He has received an e-mail invite from nonhocapito to join our forum to discuss the issue with us. I very much hope he will do so in the near future. Good job there guys, keep it up! Can anyone provide me with a list of the nations that the victims came from? Haven't found any so far and I want to check if there is any victim in my country. regex wrote: Haven't found any so far and I want to check if there is any victim in my country. Would you care to tell us which country you are from? regex wrote: Good job there guys, keep it up! "More than 90 countries lost citizens in the attacks on the World Trade Center"
Below, however, they provide what I presume should be a complete list of foreign countries involved. I can count only 54. So I guess that more than thirty-six countries are just not worth mentioning??? I 'lit a pixel' in memorandum to the victims. Really good solid research lads, well done. TV fakery has a funny side ...this was in the news today..
"On Jan. 23, China's state broadcaster, CCTV, ran a story about an air force training exercise that contained some suspicious footage. Around the segment's one minute 12 seconds mark (see above), as the China-U.S.-oriented blog Ministry of Tofu pointed out, "the way a target was hit by the air-to-air missile fired by a J-10 fighter aircraft and exploded looks almost identical to a cinema scene from the Hollywood film Top Gun." "In 2002, the popular Beijing Evening News tabloid translated and published as genuine a satirical news article by The Onion about U.S. Congress threatening to leave Washington D.C. unless the city built them a new building with a retractable roof," writes Josh Chin. "Five years later, the state-run Xinhua news agency infamously used an x-ray image of Homer Simpson's head to illustrate a story about the discovery of a genetic link to multiple sclerosis." I won't share too personal information to the public on the internet since I strictly keep my reallife away from the web. At least at this early stage of my involvement with the cluesforum. It's kinda strange btw that even wikipedia has it's priblems with the information about victims. Is there any other relyable source?